Graphic designer/artist and dobro-playing man-about-town Spencer Walts did the artwork for these great t-shirts. These are 6-color designs printed on 100% cotton (preshrunk). Colors are Pine Green, Cactus Green (pale green) and Rusty Bronze. Sizes: Medium, Large, XL and 2XL. $16 each ($18 for 2XL). Shipping for 1-2 shirts is $6.95 via USPS Priority Mail (within the U.S.). 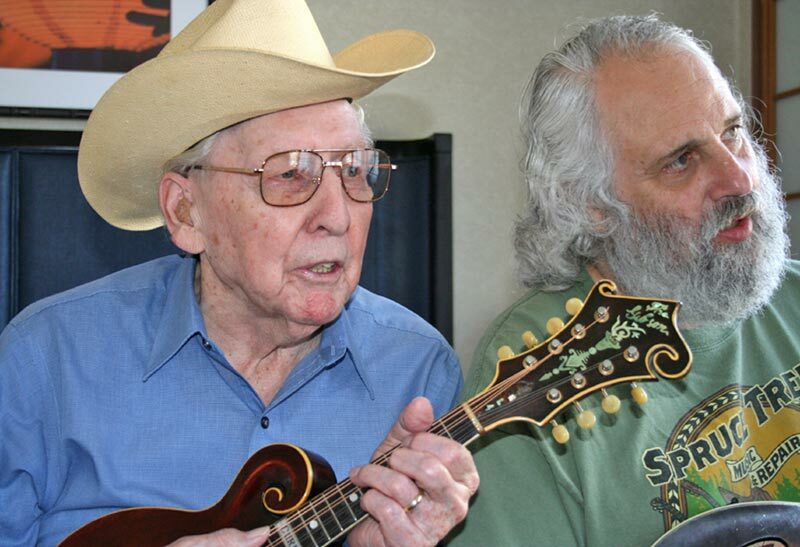 Here’s a candid photo of one of our t-shirts in action at a bluegrass festival, being worn by David Grisman. We also have a small supply of Spencer’s original t-shirt design, available in tan XL size. 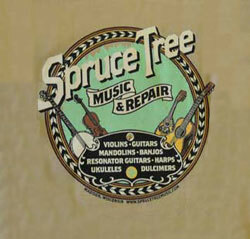 The most recent Hatch Show Print was printed to celebrate Spruce Tree’s 30th anniversary. Hatch Show Print is a Nashville company that’s been designing and hand-printing posters since 1879.This poster measure 22-1/2 x 13 inches, is 3-color, printed on smooth cardstock, and is $5.95. 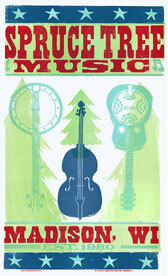 Here’s the poster from Spruce Tree’s 25th Anniversary. It measures 19 x 13 and is $5.95. Here’s our first poster, printed in 2000, on the occasion of Spruce Tree’s 20th Anniversary. We thought it would be fun experiment to have Hatch Show Print put together a poster for us since they’re stylistically quite in line with our shop. This original poster is now out of print.